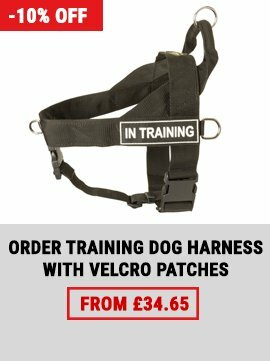 What Attack Dog Harness to Choose? Attack dog training supposes heavy workloads and attacks. 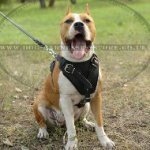 Thus the harness for attack work should be maximum strong not to tear under the action of dog's power, exceptionally comfortable and safe to protect the dog from shocks and loads of training. 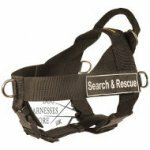 Attack training harness is meant to be of professional design and intended for this kind of work. 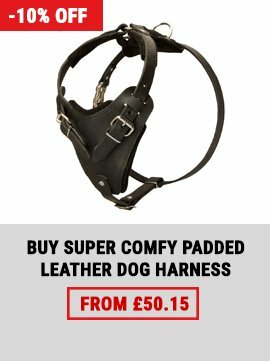 Genuine leather is the best material to produce hard-wearing, harmless and reliable harness for attack. 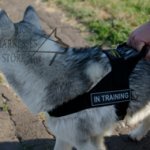 There are two designated harnesses for working dogs. Both of them have wide and padded with thick and soft felt padded chest plates to save dog's breast during training. 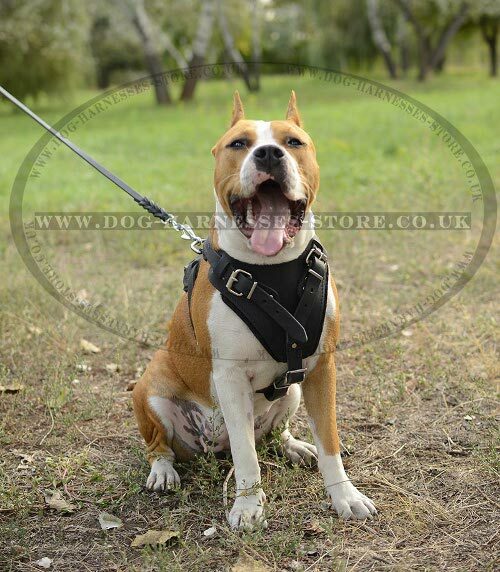 The first model of attack leather dog harness is intended for small, medium and large breeds. 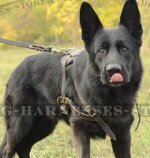 It is produced in 4 sizes and suitable for various purebred and mixed dogs. Leather is bend, but perfectly processed and well-oiled to make it pleasant to wear and flexible. Leather edges are rounded to avoid rubbing. Back plate and neck straps are also felt-lined as well as the breast plate. 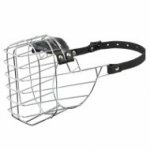 The harness is stitched for additional durability, riveted and fitted with welded hardware of nickel-plated steel. Metal details are solid and resistant to rust. The harness is 4 ways adjustable. This means you can always fit it to your dog's size perfectly. 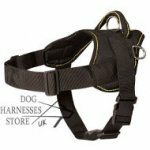 You needn't do this any time you harness the dog because there is a quick-release buckle, which helps to put the gear on and off within seconds. A leash is fastened to the D-ring at the top of the harness. It is wide and suitable for any type of snap hook. 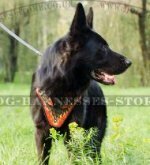 This harness is produced in black and brown colors to your choice. You can also order it with a handle on the back plate. 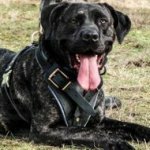 It gives you more control over the dog and allows to grab it and to hold closely when needed. 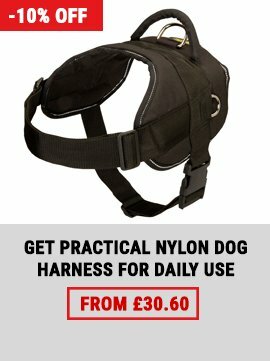 The second model of attack harness goes for middle-sized, big and huge dogs. It is handmade of selected natural leather. It is excellently manufactured, greased and well worked out along the edges. 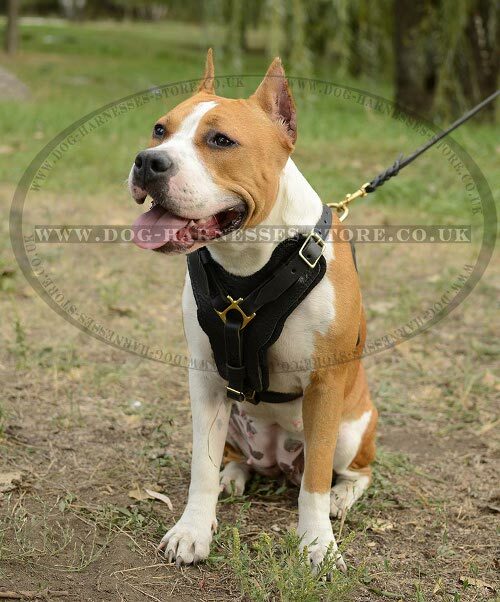 Royal design of the harness will amaze everyone. It is due to premium quality of the outfit and gold-shining brass hardware. Metal details are sturdy, welded and luxury looking. Careful stitching and riveting makes this harness super strong. You won't find uneven stitches or low-quality riveting on the harness. Every metal detail is highly-polished and smooth to the touch. Chest and back plates are padded with felt. The D-ring to fasten the leash is reliably sewed to the back plate. You will easily attach any carbine of the lead to the D-ring. 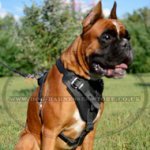 The size of the harness is regulated in 4 ways with the help of leather straps and classic buckles. A quick-released buckle makes it easy to harness the dog. There are options of color (black or brown) and handle (with or without) choosing. 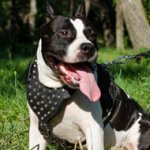 Your dog won't feel uncomfortable and have no skin problems wearing this harness! 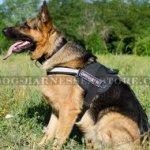 As you see, these harnesses are extremely strong and durable, dog-friendly and convenient. 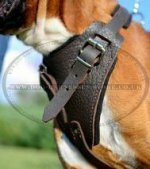 It depends on you, which agitation protection attack leather dog harness you like best. Please, write us if you have any questions.